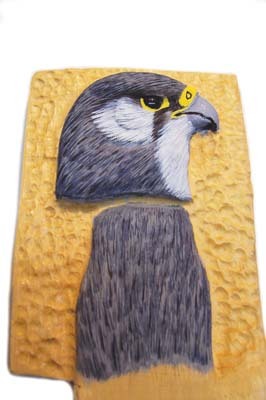 You have carved your kestrel, and you may be in the position of wanting to add some colour to make the plumage of your bird stand out. 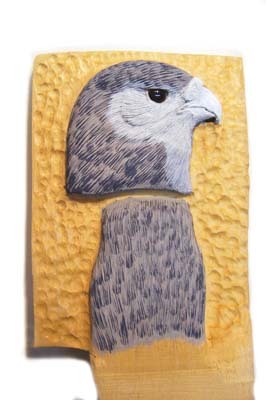 To help you with your technique, I have replicated the steps I took to painting my kestrel, and applied them to a simple piece of timber to provide a quick storyboard for you to follow. 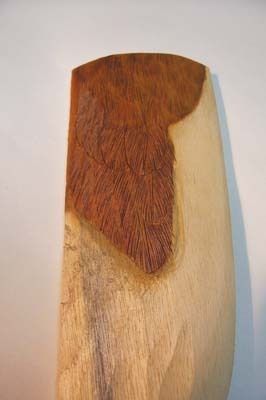 I know that not every carver likes to use paint to enhance their work, but I find it a useful technique for making bird carvings seem that little bit more life-like. 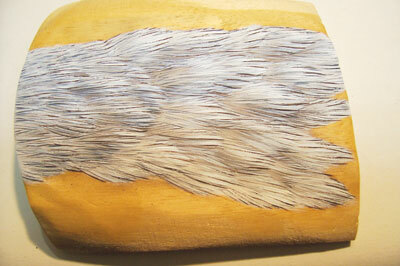 The first step I took was to apply gesso to the breast area (see gallery image 1). For those of you not familiar with this procedure, gesso is rather like paint. It is a thick acrylic primer which has to be thinned with water, otherwise it would fill in all the burning detail on application. I dilute mine to the consistency of single cream. 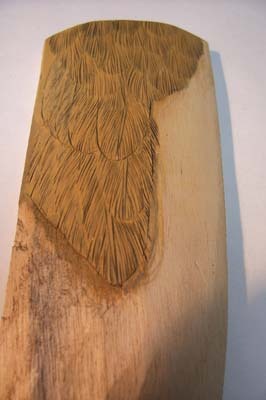 The next step is to apply a base coat of Raw Sienna to the back of the bird (see gallery image 2). 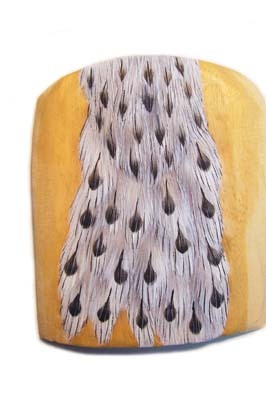 Returning to the breast area, use an airbrush to apply medium grey to the feathers (see gallery image 3) - to get this colour, I add a small amount of black acrylic to white gesso. By airbrushing, you get a nice and natural effect, which doesn't look blocky. 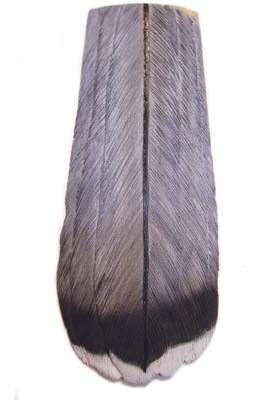 Staying with this area, take a No.1 sable brush and using white gesso, stroke the brush from the outside edge of the feather to the centre of the feather (see gallery image 4). Round off by painting in some dark splits at random (see gallery image 5). In the next stages, I want to use a rust colour, which I make up using Jo Sonja's 80% Burnt Sienna mixed with 10% Burnt Umber, and 10% Yellow Oxide. 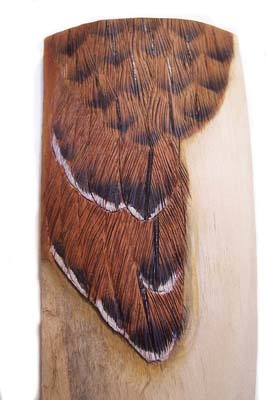 With a mixture of the rust and Burnt Umber, build the colour of the back feathers with thin washes (see gallery image 6). 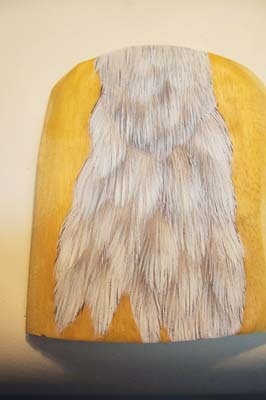 Next, taking thin card templates, airbrush dark markings on the back, and edge each feather with white (see gallery image 7). The templates can easily be made up yourself by cutting out the desired patterns on some card and placing against your carving, airbrushing on the effect. 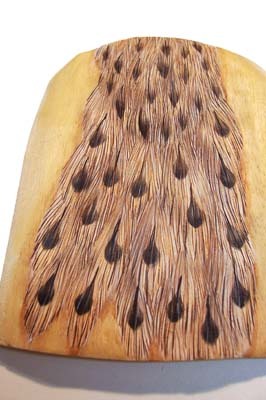 Again using card templates, airbrush small teardrops onto the breast area to add detail in the feather areas (see gallery image 8). For painting the head area, apply a base coat on the head using Nimbus Grey, then apply gesso to the mandible, throat area and side of the head (see gallery image 9). Using a mixture of slate (Paynes Grey mixed with Ultramarine Blue and White), and a small amount of Paynes Grey, give the head area thin washes. 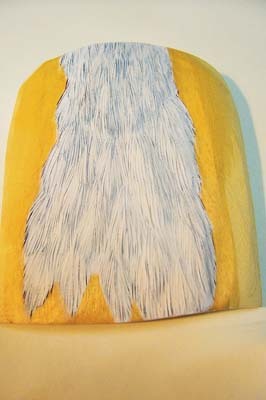 Intensify the white areas with thin washes of Warm White, paint in the sear - the skin above the mandible - and the ring around the eye in a plain yellow, and paint in the malar stripe - dark moustache (see gallery image 10). Moving on to the tail feathers, apply a base coat of Nimbus Grey, allow to dry, and then add thin washes of slate (80%) and Paynes Grey (20%). Build up to the colour desired. Next paint in the shafts with a dark colour (see gallery image 11). All that is left to do now is to finish off the breast and head areas. 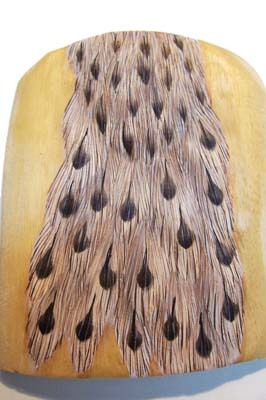 Using a very thin wash of the Burnt Umber and rust, apply over the breast feathers (see gallery image 12). 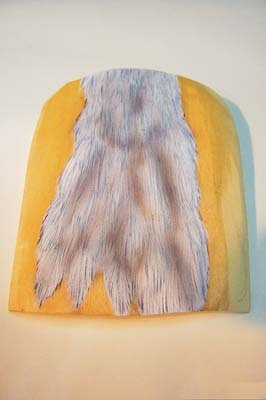 Allow to dry, and then apply a final, thin Burnt Umber wash (see gallery image 13). For the facial area, apply some dark markings to the cheeks and head, and darken the tip of the mandible. Finish the kestrel with a coat of matt varnish to the mandible and feet. Mike used the following colours from the Jo Sonja acrylic paints for his kestrel: White Gesso, Raw Sienna, Burnt Umber, Titanium White, Warm White, Nimbus Grey and Paynes Grey. To purchase these paints, contact Flutterby Crafts.